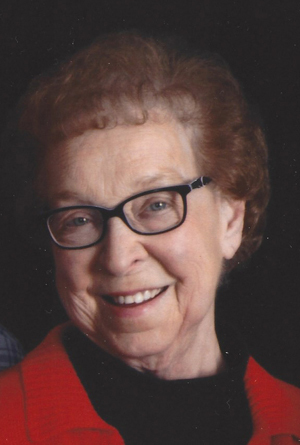 Clarise Rapp, 86, of Cannon Falls died peacefully in her sleep on Sunday morning, September 2, 2018, at The Gardens of Cannon Falls. Clarise Florence (Larson) Rapp was born at home on a rainy Sunday morning on May 24, 1932, to Florence Stecker Larson and Thomas Helmer Larson. She was the fourth of eleven children in her family. The family grew up in Cannon Falls and lived in a modest home at 517 West Belle Street. 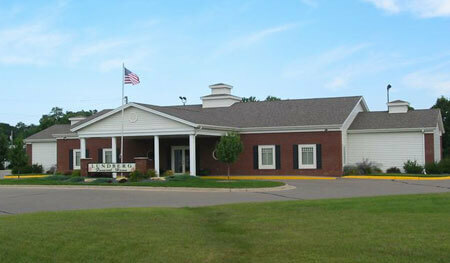 Clarise attended school in Cannon Falls, after which she started baby-sitting for her sister Carol’s family. When she was fifteen years old, she started working at Mineral Springs Sanatorium. Her shift in the kitchen started at 4:30 A.M. and ended at 12:30 P.M. When she was 16, she started dating George Rapp. On December 26, 1948, their first date was taking a drive to Hampton. Clarise was urged to drive, even though she had never driven before. She attempted to pass a vehicle and ended up off the road near a trestle on Old Highway 52. Luckily no one was hurt, but the date must have been a success because George and Clarise were married 2 years later on June 24, 1950. They started their married life in rural Cannon Falls where four of their six children were born (Sandra, David, Sheri, and Julie). They later bought their existing home on the east side of Cannon Falls on Minnesota Street where the last two children were born (Daniel and Michael). Clarise raised her family and worked out of the home when the children were school-aged. She worked at The Sheldahl Company in Northfield, Brockway Glass in Rosemount and Point of Sales in Cannon Falls. In 1973, Clarise was diagnosed with Rheumatoid Arthritis and had to give up her job, but it gave her more time to tend to her family. She raised two of her grandchildren and provided “Grandma Day Care” for many of the others. Clarise is known by many for the delicious meals she made. If you happened to stop in, she would have enough food for you and your family. If it wasn’t mealtime when you visited, you would be treated to cookies, bars, and all the coffee you could drink. As her arthritis continued to take its toll, Clarise had surgery on both knees, both feet, and one hand. Despite her pain, Clarise kept cooking, baking, and enjoying her other hobby, quilting. She was inspired by the wonderful memories of quilting with her mother and friends. If you knew Clarise, you were probably the recipient of one of her wonderful, hand-tied quilts. We would love to know how far her quilts would stretch if we could line them up end to end. Her quilts gave warmth and comfort to many, and this wonderful woman has left her family feeling that warmth and love. She is survived by her loving husband of 68 years, George of Cannon Falls, six children; Sandra (James) Jesse of Roberts, Wisconsin, David (Bonnie) Rapp of Kenyon, Sheri (Greg) Johnson of Cannon Falls, Julie (Mike) Regenscheid of Bay City, Wisconsin, Daniel Rapp of Mesa, Arizona, and Michael (Bonnie) Rapp of Hampton, siblings; Gordon and Richard Larson and Sharon Johnson, fifteen grandchildren, twenty two great grandchildren, three great-great grandchildren and many nieces and nephews. Clarise was preceded in death by her parents, her sisters; Carol Fox and Darlene Heinz, and her brothers; Lloyd, Merlin, Darrell, Donald, and Ronald. Visitation will be held at Lundberg Funeral Home, 5839 Hwy 19 Blvd, Cannon Falls, MN 55009, on Thursday, September 6th from 4 – 7 PM. Funeral services will be held at First English Lutheran Church, 511 W. Belle St., Cannon Falls, MN 55009, Friday, September 7, at 11:00 AM followed by luncheon and fellowship..
Memorials are preferred to the Cannon Falls Food Shelf or to the Juvenile Diabetes Research Foundation.